Have you ever wondered why most cakes are baked at 350? F? And why do cookbooks and baking authorities make such a fuss about making sure your oven temperature is accurate? What is it about that mystical number on the oven�s dial that makes it work so well for baking and what happens if, heaven forbid, your oven temperature is off? Let�s take a quick look at the effect of oven temperature on the baking process and how you can take control of the outcome of your baked goods with a little thermal know-how. I baked a number of cakes from 300? F to 400? F to provide a practical example of how oven temperature alterations can modify the end results. A cake baked at 300? F is lighter and fluffier than a cake baked at 400? F. The cake baked at 300? F also has a pale even outer crust which remains gummy due to the reduced degree of evaporation at the cake�s surface. The 400? F cake has a dark, ledged outer crust with a more dried surface. The evaporation of water on the surface of the cake enables caramelization processes to occur. Caramelization can add flavor but if taken too far can lead to a burnt, acrid taste. The other notable difference in the cakes with various temperatures was in the consistency of the crumb. The cake baked at 300? F had a very soft, smooth crumb while the cake baked at 400 F had a slightly more rough-textured mouthfeel. This is likely due to the speed under which the proteins coagulated. Cakes baked through the spectrum of temperatures between 300? F and 400? F display gradual variants of these two extremes. Baking at 350? F is sort of a happy medium between 300? F and 400? F and creates a cake that has the best of both worlds. It has lightness, texture and caramelization induced flavor. There you have it! Altering the temperature in which you bake has a significant effect on the outcome of your cake. 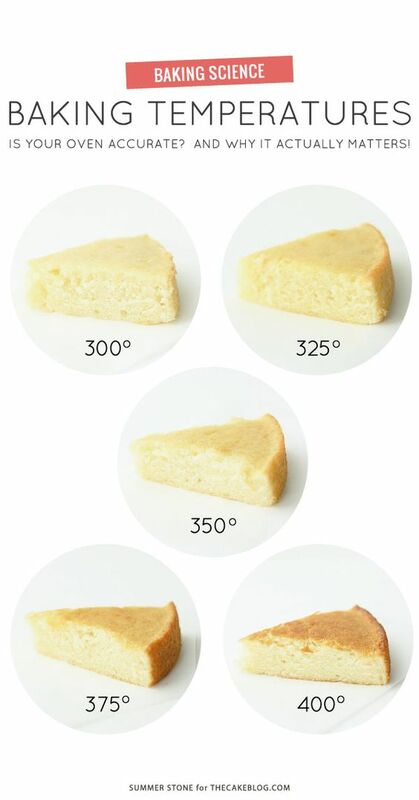 By knowing the accuracy of your oven, you can better predict the final result of your cake. If you�ve ever baked a recipe and wondered what went wrong, give your oven temperature a second look. Most ovens are calibrated inaccurately, leaving you unaware that you�re baking at a temperature above or below what your recipe specifies. It is helpful to purchase an oven thermometer to test the temperature and then adjust as needed.